Hello! It's officially December now, so I can finally get away with Christmas nails (not that I haven't snuck a couple in already!). 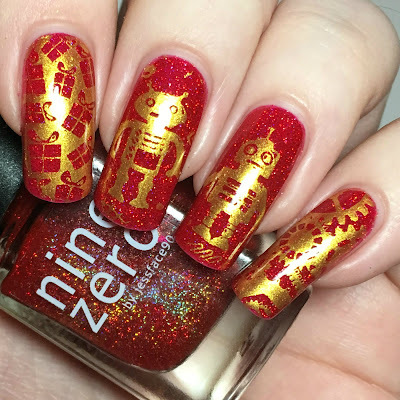 I was recently sent some more items from Born Pretty Store to review, among which was a cute robot stamping plate and a gold stamping polish. I paired these two together and tried my best to make it Christmassy! Here is what I came up with. Read on for more info! I started off with a base of Nine Zero Lacquer 'Santa Suit', a bright red jelly with gold holographic microglitter. The jelly base in this is much more opaque than I expected, and applies very smoothly and evenly. It was a bit sheer on the first coat but covered fully with two. The microglitter is very fine so does not leave the polish textured. Below is two coats and topcoat. I stamped using the Born Pretty gold stamping polish (item #27226, online here). I used my current favourite clear stamper, also from Born Pretty (reviewed here). I picked out two robots for my middle and ring fingers, and some of the cogs for my pinky finger. I had a perfect pick up each time. I finished off by adding some presents from Uberchic Christmas plate 02 to my pointer finger. What do you think? I think everything works together quite well! It's nice to do something a little bit different (not that I don't have lots of cheesy Christmas manis coming!). 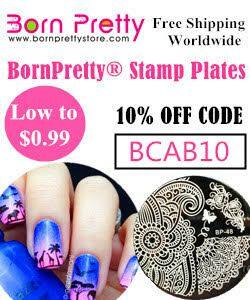 I had absolutely no issues with either the Born Pretty Store stamping plate or polish used in this, so I can happily recommend both! I also have fallen a bit in love with 'Santa Suit' - who doesn't love a sparkly red at Christmas?! 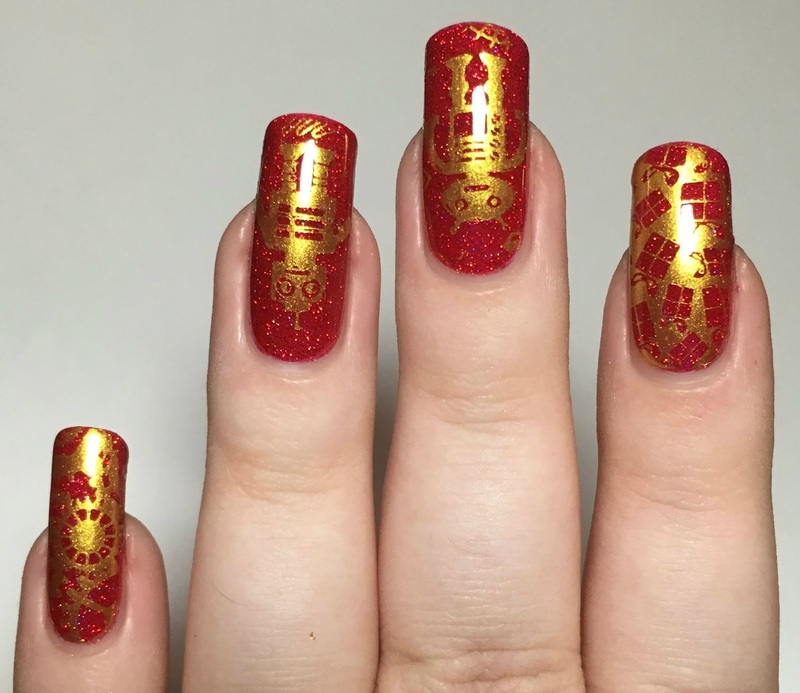 That gold stamping polish looks awesome! soo...I need that robot plate. What a great stamping plate! I love the variety in the gear designs and the assortment of robots! That plate is so great and I love your stamping! The gold looks stunning. I forgot I bought Santa Suit and need to find it to wear for the holidays. That is such a cute stamping plate! Love the colour combo you chose. I love the colour combo and the robots. I've never heard of Christmas robots, but I'm betting they'd be my fave kind. 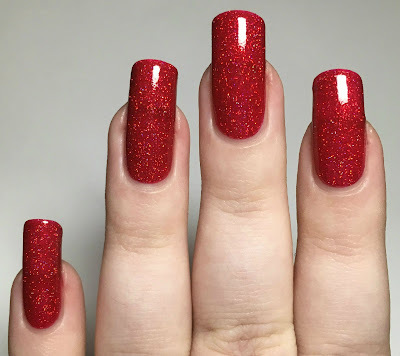 What a stunning red for the holiday! Love your nails! Oh these robots are so much fun! I love the robots in gold. That's a really fun idea for a manicure! Love it! these are so so fun!! love red and gold as always! 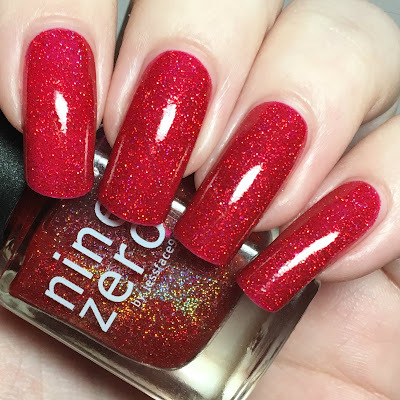 That Nine Zero polish is GORGEOUS! That is such cute nail art.